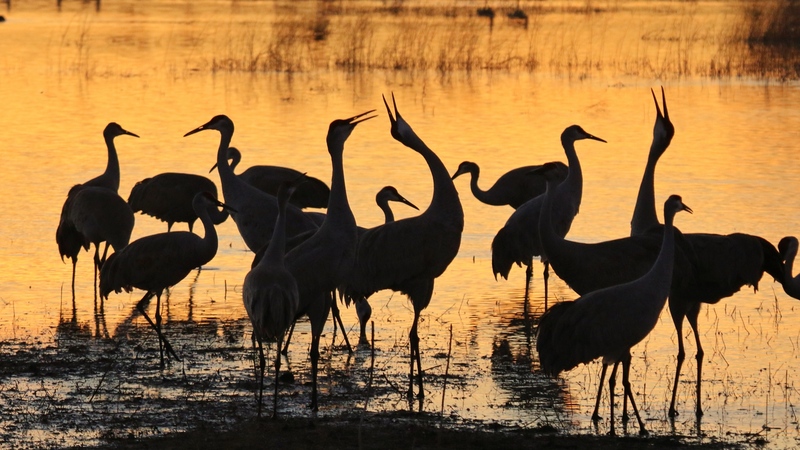 Looking over the photos from our recent trip to the west coast, I remembered I had shot some video clips of the Sandhill Cranes arriving at their overnight roost on the Rio Grande floodplain at Bosque del Apache, New Mexico. They have an impressive wingspread when you see them up-close. 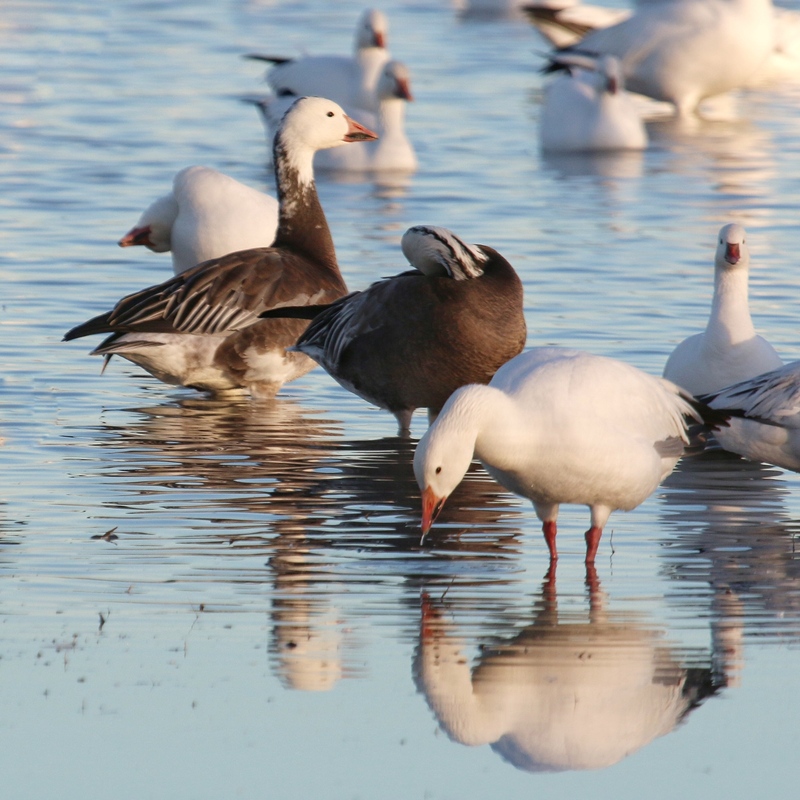 Snow Geese may be overtaking the world; well, at least their Arctic breeding grounds. And when they invade their winter headquarters, they dominate that landscape as well. We thought there must be a thick layer of salt along the edge of the Rio Grande flood plain when we looked across the expanse of blue water. 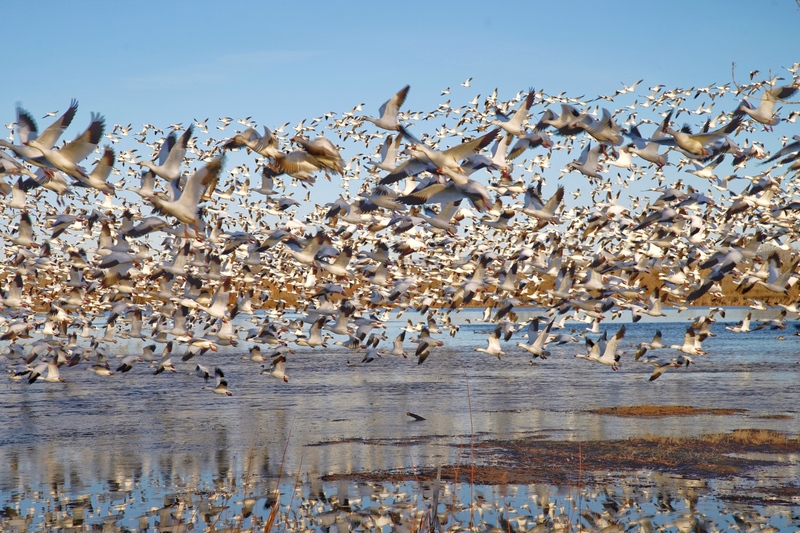 That’s not a line of salt crystals along the shoreline, it’s a dense pack of Snow Geese! Ruddy Ducks are in the foreground. 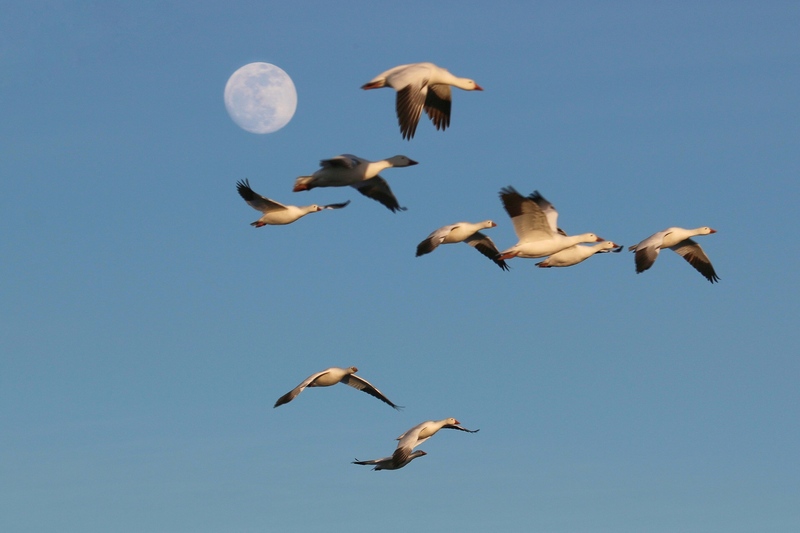 High densities of Snow Geese congregate in their select winter headquarters in the U.S. and eastern coast of Mexico. 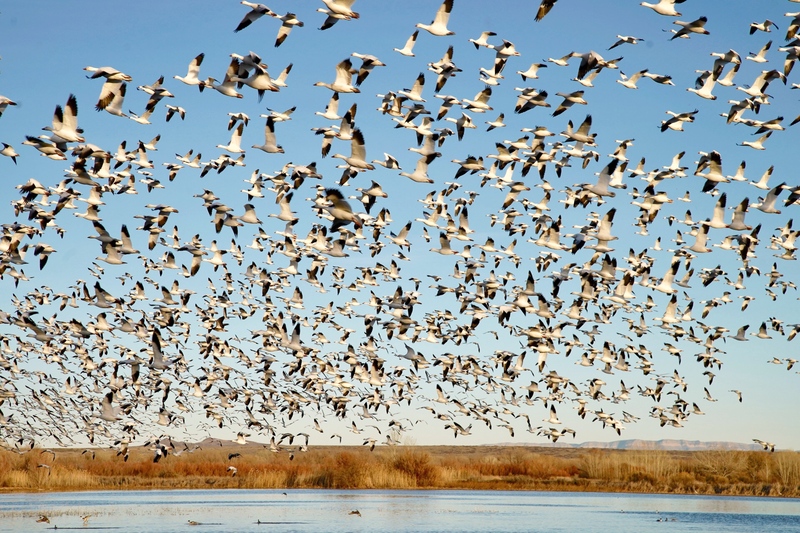 There must have been tens of thousands of these medium sized geese, crowded together in the shallow water of the Rio Grande. 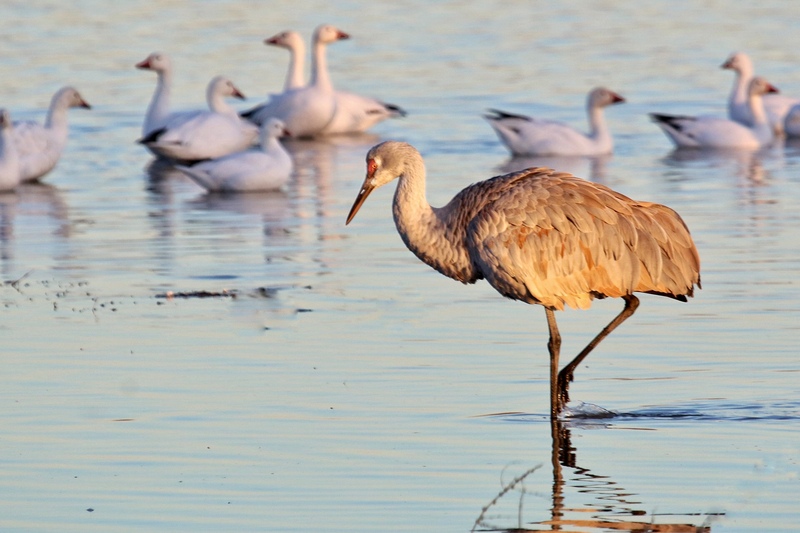 They are described as “voracious herbivores”, eating any and all parts of a plant, ripping up roots and all, or just shearing off the tops of grasses, sedges, and other aquatic plants. Digested food passes through their gut in just a couple of hours, so just imagine how much goose poop is going into this section of the river! 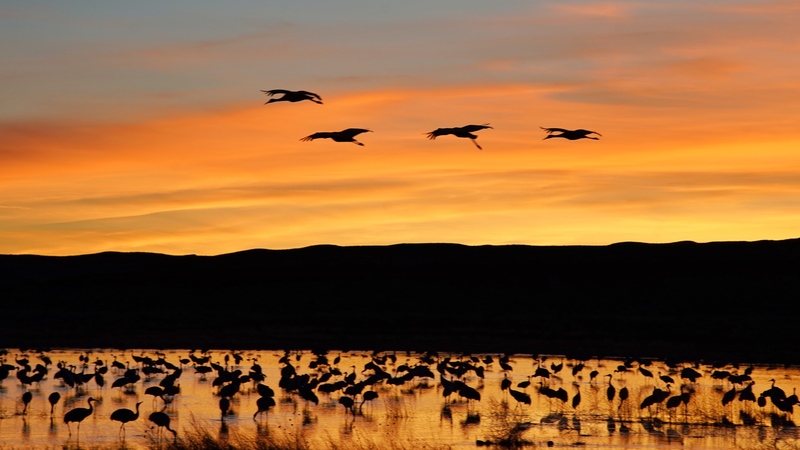 Their voracious foraging is what has been decimating their tundra breeding grounds, as more and more geeese arrive each year to raise their chicks. 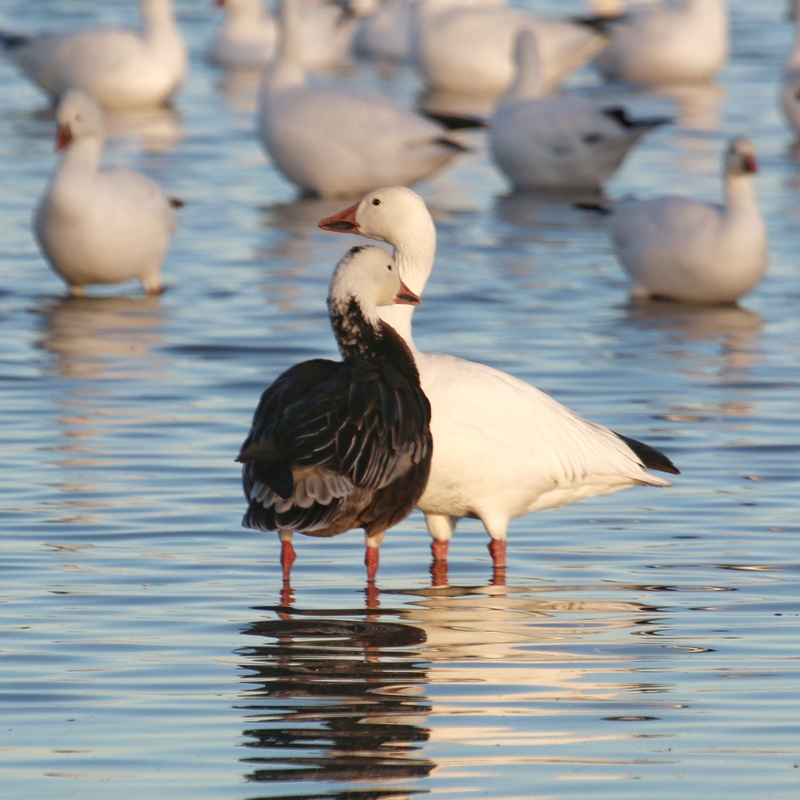 Snow Geese come in two color phases: white- and dark-bodied. The dark form was once believed to be a separate species, called the Blue Goose. Color is controlled by a single gene, but the dark allele is dominant over the white variant (actually dark is Incompletely dominant, to be technically correct). 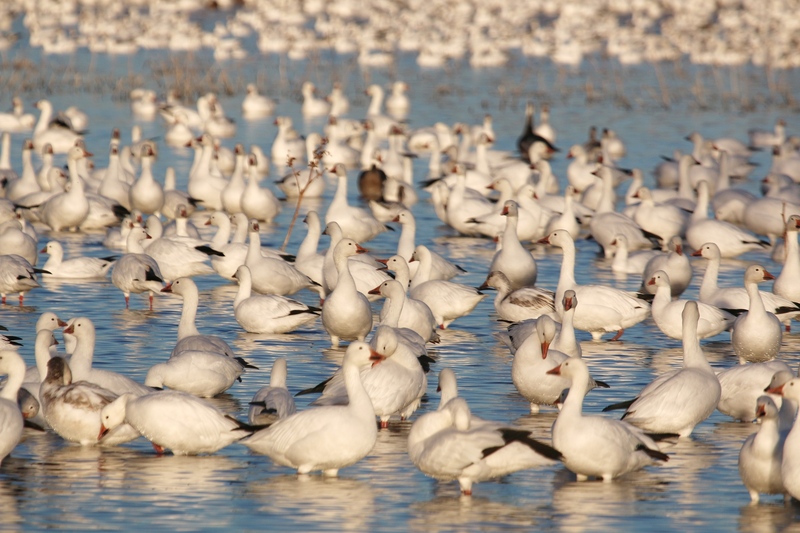 So, this raises the very obvious question: if dark color is dominant, why are there so many white Snow Geese? The amount of color is variable, depending on whether the individual has one or two dark alleles. 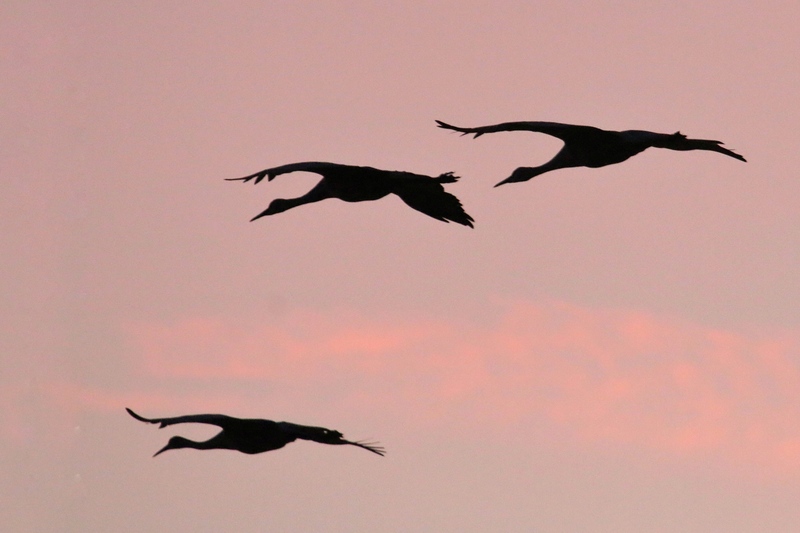 Of the 3 most prominent birds in this photo, the one on the right has no dark alleles, the one in the middle might have two dark alleles, and the one on the left with less dark coloration might have one dark and one light allele. The Snow Geese put on quite a display for us, with massive numbers of them taking off, circling in front of us, and then settling back on the pond. You have to marvel at their ability to fly in such close quarters without running into each other. Right in front of us…. 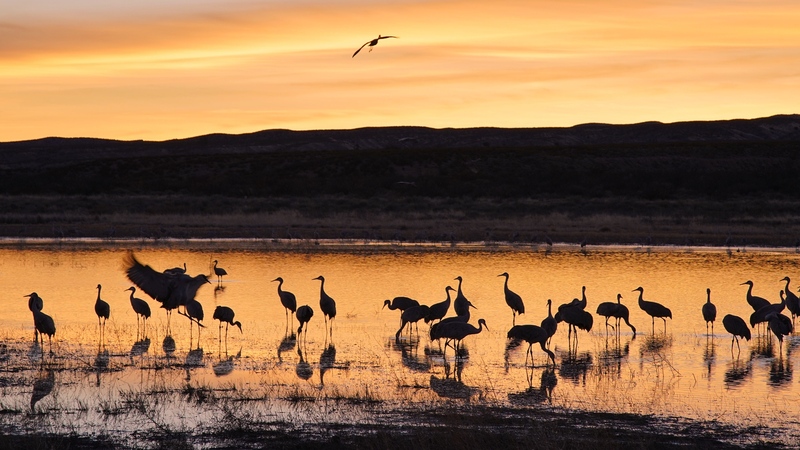 Bosque del Apache (literally “woods of the Apache”) is a 3800 acre wildlife refuge in the floodplain of the Rio Grande River in southern New Mexico that was set aside in the late 1930s as a wintering spot for waterfowl. 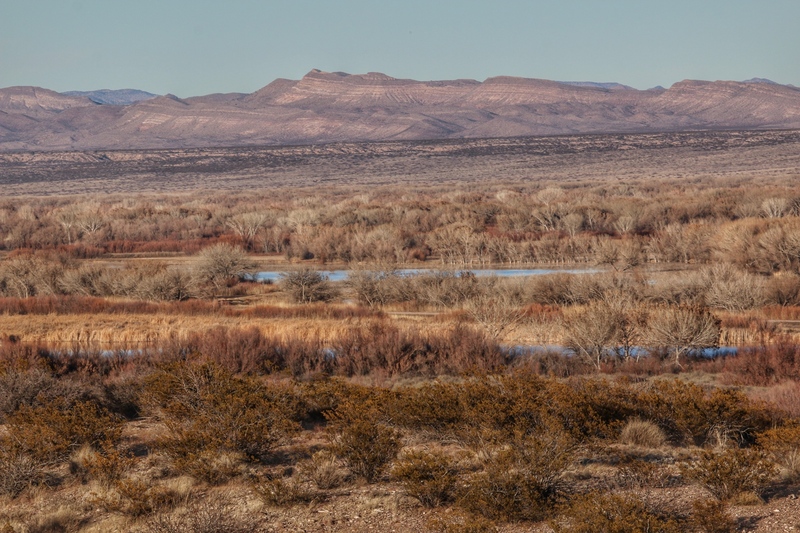 One can look down on the flood plain of the Rio Grande River from an overlook a couple of miles away. 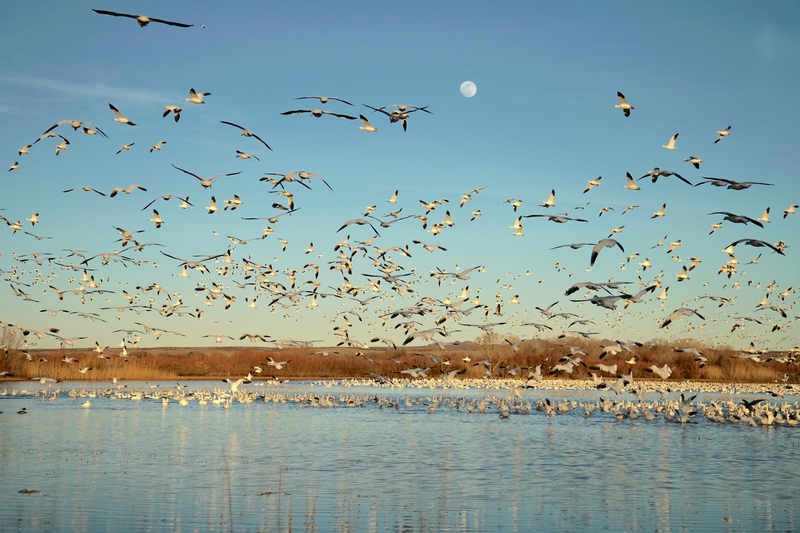 We had no idea how many thousands of birds were concentrated there. 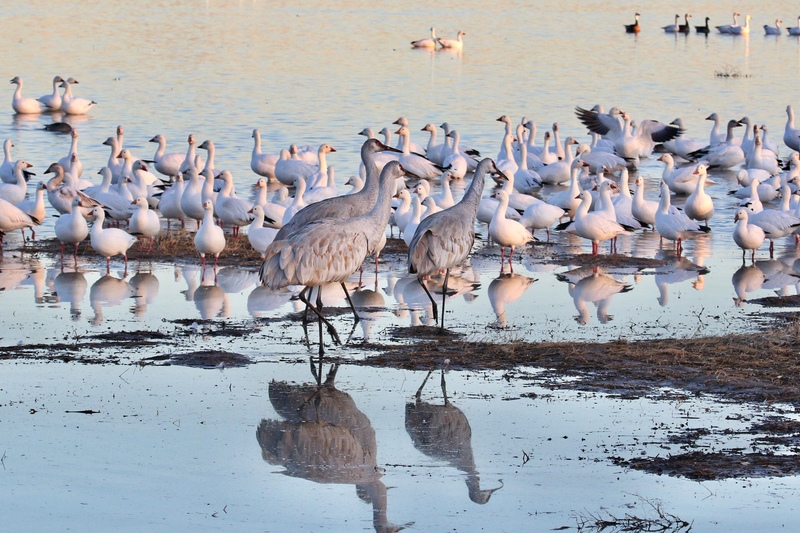 The Snow Geese don’t seem to mind that Sandhill Cranes walk through and over them. 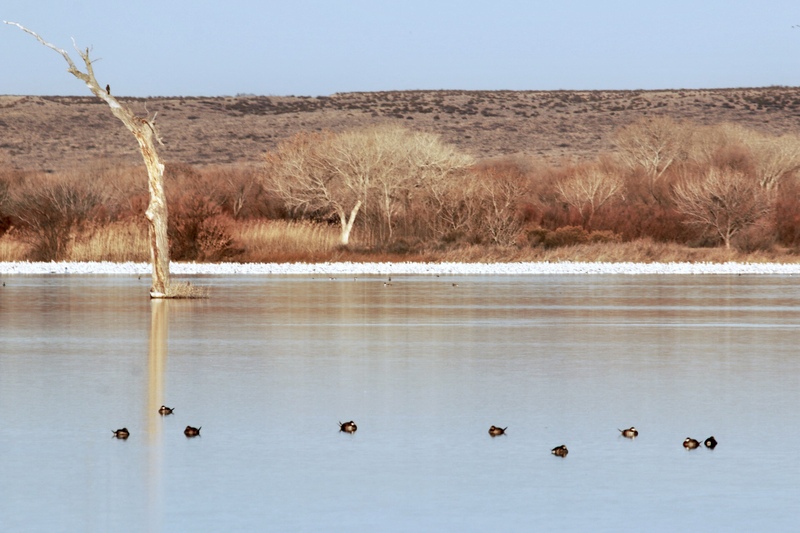 Hundreds of birds congregated in a shallow lake right next to the road through the refuge, completely unperturbed by all the photographers lined up on the shore about 100 feet away. 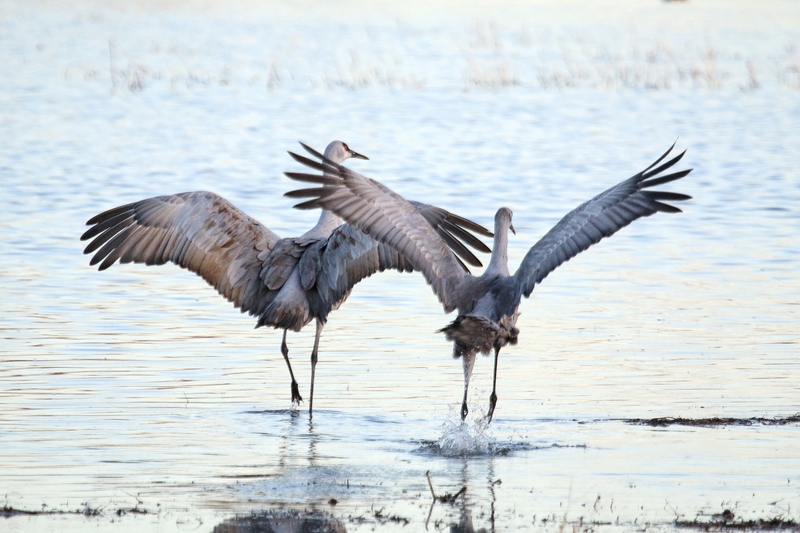 As is usually the case with Sandhill Cranes, they continually vocalize as new birds fly in, landing often in the middle of a clump of others.